Delhi, home to India’s capital New Delhi, is the largest city in India and second most populous in the world, with a population of 22 million. Delhi has been continuously inhabited since the 6th century BC and has been built, destroyed and rebuilt many times by its numerous rulers. Old Delhi, originally founded as Shahjahanabad in 1639 by Mughal Emperor Shahjahan, was once the capital of Islamic India, covered with lush gardens, lavish mansions and beautiful mosques. Today, it is characterized by the remnants of its glorious past, narrow lanes and bustling marketplaces – it remains the heart of metropolitan Delhi. On this heritage tour, you will enjoy a drive past the Red Fort and Jama Masjid and explore and learn about the origins of Old Delhi. Through walking through the streets of Old Delhi, you will visit havelis, the Paranthe Wali Gali (a 200 year old food street) and Khari Bhaoli (Asia’s largest spice market), as well as board a rickshaw to the Fatehpuri Masjid. You will enjoy a lunch at the Chor Bizarre Restaurant. Begin your exploration of Old Delhi with a drive past the Red Fort, a symbol of Shah Jehan’s Mughal power and elegance, and then a visit to the Jama Masjid, India’s oldest mosque. You will then proceed on the heritage walk through Old Delhi, getting a first hand introduction to 350 years of history. As you wander down the narrow bustling lanes, you can feast your eyes on the haveli facades, the walk taking you onto the main street, Chandni Chowk. Condinue through to the Dariba Kalan (Asia’s largest jewelry market), past the Naughara (the nine Jain havelis) visit the Jain temple, and shop at the colourful Kinari Bazaar. 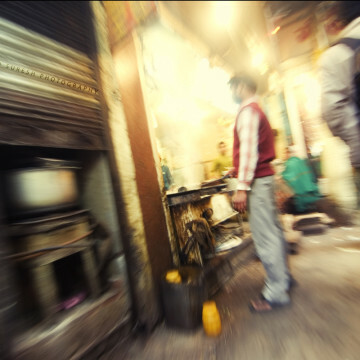 Visit the Paranthe Wali Gali, a street noted for a series of shops selling paratha (Indian bread) – sample the delicious food! Board a rickshaw to the 17th century Fatehpuri Masjid, and then visit the Khari Baoli, a street known for Asia’s largest spice market! End the day with a lunch at the Chor Bizarre. Price includes pick-up/drop-off at hotel, guide, all transportation and lunch.